Latino students make up a third of California's higher education student population — a million students in total. Another 3.3 million Latino students attend the state's K-12 public schools, exceeding the total student populations for every other state except Texas. Almost all Latino youth under the age of 18 — 95 percent — were born in the United States. While the educational outcomes for these students have improved in recent decades, according to a new report from the Education Trust - West, there's still plenty of room for progress. For example, among all ethnic groups, "Latino adults are least likely to have a college degree." While that share was 10 percent in 2005, it had only inched up to 11 percent by 2015. The non-profit works on issues of "educational justice and high academic achievement," especially for students of color and living in poverty. "The Majority Report: Supporting the Educational Success of Latino Students in California" examined how Latino students are doing in K-12 and higher ed while highlighting "bright spots" where "promising practices" are helping those individuals advance academically in school. The challenges begin early. As the report explained, Latino three- and four-year-olds are less likely than Whites, Asians or African-Americans to attend preschool because of a lack of affordable preschool options and a dearth of early childhood workers who can speak other languages than English. 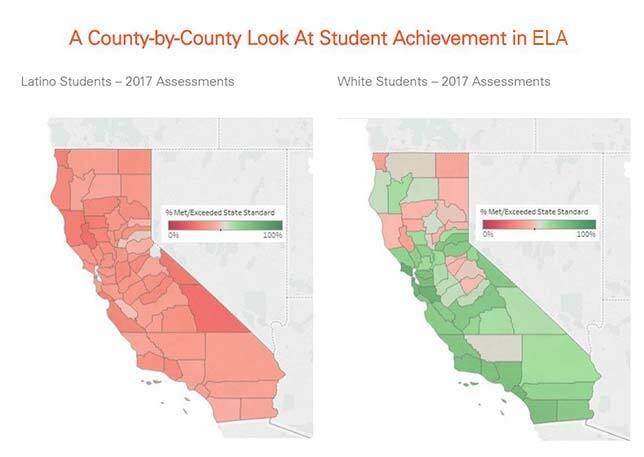 County-by-county outcomes of student achievement in ELA and math. Source: The Education Trust - West. Once these kids have gone into K-12, they may be placed in a setting where they're more likely to be taught by less effective teachers, such as is the case for students in the Los Angeles Unified School District, which teaches one in seven of the state's Latino students. (The same imbalance is true for black students in that school system.) As high schoolers, they're less likely to have access in their high schools to A-G-required classes or Advanced Placement courses than other demographic groups. As a result, Latino students are less like to arrive prepared for college, the report stated. Along with black students, they're more likely to be directed into remedial courses because they lack the prerequisites or perform poorly on placement tests. In community colleges, for instance, nearly nine in 10 Latino students are taking at least one remedial class. Fortunately, the report noted, some aspects of the education landscape is being revised in ways that could benefit Latino students. As one example, San Diego Unified School District has implemented a policy where all of its students must finish the A-G course sequence in order to graduate from high school. For the class of 2016, almost half of which were Latino students, a record high of 88 percent earned their diplomas, "far exceeding the state average." As another example, Val Verde Unified hosts a family resource center in all of its traditional high schools. It also has a bilingual family engagement center to provide help on college-related applications and to deliver courses on computer literacy, parenting and English as a second language, among other topics. Last year, more than 7,000 parents participated in activities at the center. In the realm of higher ed, the California State University system has dropped math and English language arts placement tests and will use other mechanisms to determine college readiness for their candidates. And this year the state created the California Community Promise program, which grants one year of free tuition to all first-time, full-time community college students. The report ended with numerous recommendations. Ultimately, success will require "transformative change" to support Latino students, the report insisted. "It goes beyond replicating programs that work well," the conclusion stated. "Most of all, it will take state, county, district and community leaders refusing to be content with an incremental chipping away at these disparities." 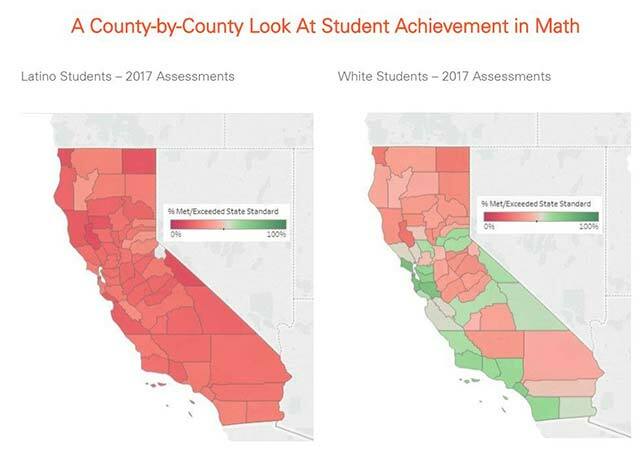 The full 28-page report, as well as data tools for doing county-by-county comparisons of assessment outcomes are openly available on the Education Trust - West website.